GRAFENWOEHR, Germany — U.S. Army Garrison Bavaria honored Soldiers for their service and career at the quarterly retirement ceremony, here, August 29. The USAG Bavaria Garrison Chaplain, Col. Kevin M. Pies, thanked the retirees for their accomplishments and sacrifices made in service to the country — in both times of peace and conflict. 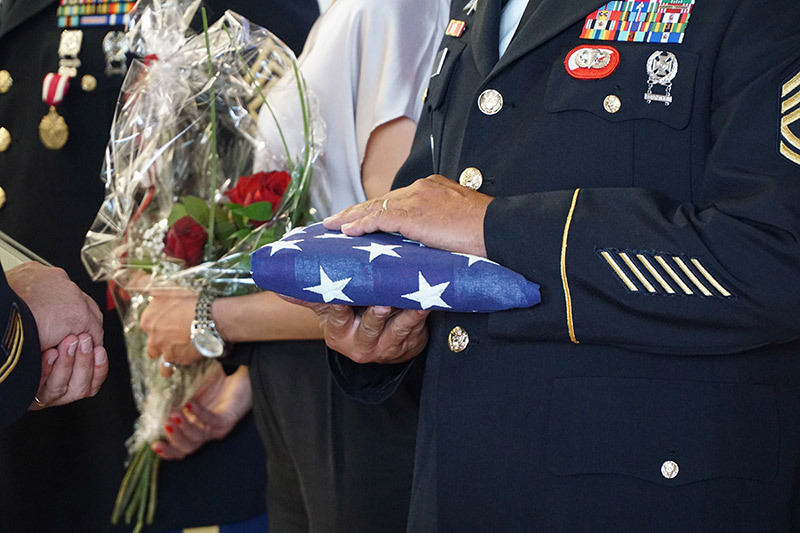 Six Soldiers in our community retired from the military after years of dedicated service. They include 1st Sgt. Melvin Reid, Master Sgt. Gary A. Taylor, Sgt. 1st Class Edward T. Harmon, Sgt. 1st Class Troy L. Rudolph, Staff Sgt. Glen W. Hambrick and Staff Sgt. Christopher M. Oliver. 1st Sgt. Melvin Reid accomplished 35 years of service. He began his journey in the Army in 1990. Most recently he served as a First Sergeant while assigned to the 44th Expeditionary Signal Battalion and has two years and two months of combat experience. A major highlight in the Army was for him to serve as first sergeant seven different times throughout his career and obtain his bachelor’s degree. Master Sgt. Gary A. Taylor began his journey in the Army in 1983 and has six years of combat experience. Most recently he served with Headquarters Troop, Regimental Support Squadron, 2nd Cavalry Regiment, with duty as the USAG Bavaria Directorate of Public Works Noncommissioned Officer in Charge. His highlight in the Army was serving as an acting command sergeant major for 14 months with the 101st Airborne Division. Sgt. 1st Class Edward T. Harmon began his journey in the Army in 1995 and has one year and eight months of combat experience. Most recently he served with 1st Squadron, 91st Cavalry Regiment, 173rd Airborne Brigade, as a senior culinary management NCO. His major highlight in the Army was winning the Phillip A. Connolly Award, which recognizes the best dining facility in the Army, while serving as the DFAC manager for the 10th Special Forces Group. Sergeant 1st Class Troy L. Rudolph began his journey in the Army in 1993 and has one year and nine months of combat experience. Currently he serves as a watch officer in the USAG Bavaria installation operations center. A major highlight in the Army for Rudolph was being detachment NCO in charge of an eight aircraft medical evacuation unit at Fort Rucker, Alabama. Staff Sgt. Glen W. Hambrick began his journey in the Army in 1998 and has one year of combat experience. Most recently he served as the religious affairs specialist and fund manager with Headquarters and Headquarters Company, USAG Bavaria. Staff Sgt. Christopher M. Oliver began his journey in the Army in 1998 and has four years of combat experience. Most recently he served as the NCO in charge of the Directorate of Human Resources, Military Personnel Division in-processing section where he oversaw the arrival of new Soldiers and their families to the community. Combined, these six Soldiers rendered more than 151 years of service. More photos from the ceremony are available at www.flickr.com/photos/usagbavaria/albums/72157670719049377.